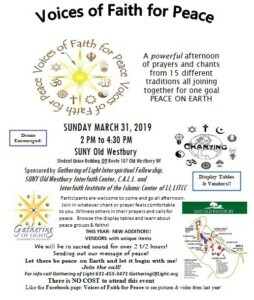 Home/Voices of Faith for Peace takes place Sunday, 3/31 at SUNY at Westbury, Student Union at 2pm. Please, join us! 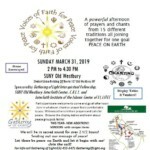 Please, join Fellowship members this Sunday as we represent one of the 15 faith traditions taking part in an afternoon of sacred chants, songs and prayers for Peace on Earth. This Island wide event features faiths and cultures from around the world. Join us at SUNY at Old Westbury at 2pm on Sunday, 3/31 at the Student Union Building, Rte 107, Old Westbury. This enchanted experience of peace and harmony envelops us in an atmosphere of peace. Join in as we form one community of many different faith traditions with one goal of peace. Musicians from many traditions take part as well eventually culminating in a universal song of peace. This is an audience participation event not a performance. All are encouraged to sing together, words are distributed. This year there will also be vendors and some faith traditions distribute food and beverages. There is no discussion, explaining or talking during the event, just sacred sound. Please, join us for a unique and blissful experience. For directions Google the bookstore at Suny at Old Westbury. Free. All welcome. 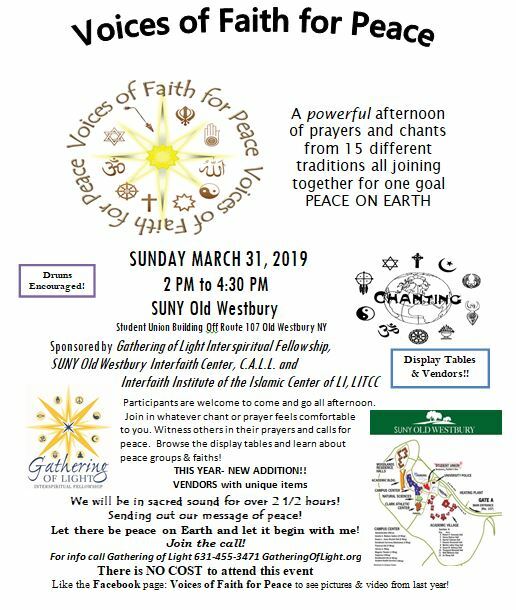 By admin|2019-03-26T09:38:23-04:00March 26th, 2019|General News & Announcements|Comments Off on Voices of Faith for Peace takes place Sunday, 3/31 at SUNY at Westbury, Student Union at 2pm. Please, join us!